PortSide NewYork WaterStories programs take many forms in many media (music, book readings, movies, performing arts, digital and analogue exhibits, walking tours, hosting visiting vessels) with water, waterfront or maritime in the theme. PortSide produces and hosts innovative waterfront programs in NYC. We create programs in industrial spaces, parks, and storefronts, and on historic ships. If it is on our historic tanker ship, the MARY A. WHALEN, the word tanker is usually in the name as in TankerTunes, TankerFlicks, TankerTalks, TankerTours, TankerTime. Our work is multi-faceted and multimedia. For 12 years, we sought a site with building space, so we can expand programs and deliver programs in all weather and throughout the year. The tanker, as captivating as she is, does not have space for large groups of people when the main deck can't be used due to snow, rain, high wind or heat. 2018 looks like the year for this expansion to happen! Let us know what PortSide programs you would like! October 2016, we launched Red Hook WaterStories, a digital maritime museum and in-depth guide to Red Hook, Brooklyn. 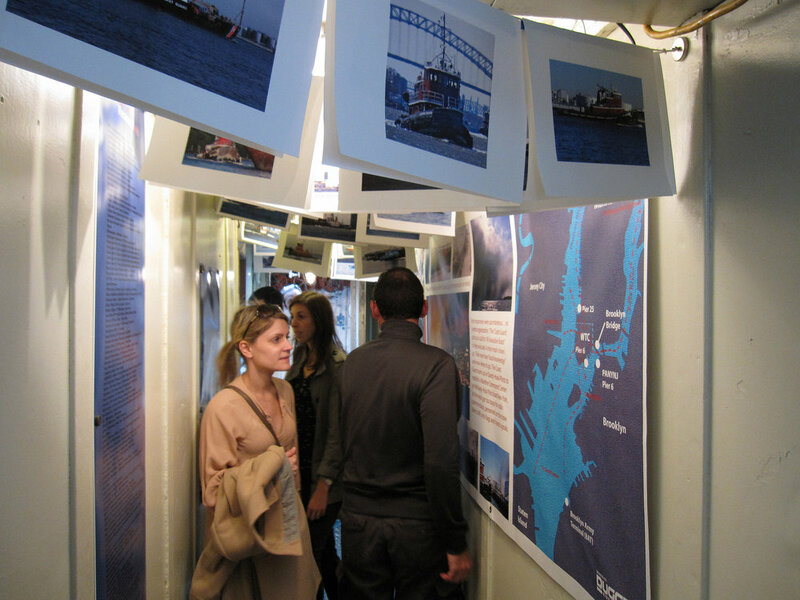 Red Hook WaterStories tells NYC maritime story in microcosm. This is version 1.0. Version 2.0 will launch in May 2018 during the "MARY Month of May" festival in honor of the 80th birthday of our ship MARY A. WHALEN! The public is invited to enjoy the main deck of the tanker, cool sea breezes, and harbor sunsets. You can bring dinner, a bottle, a book, or a sketchpad. We provide the hammocks, tables and chairs. Volunteer and help us do this more weekend evenings! Just takes 2 people per night! Bilingual ship tours We offered the first, free, public, bilingual historic ship tours in NYC at the 2nd annual Concierto Tipico, a salsa concert on Pier 4, Brooklyn Army Terminal, Sunset Park. We gave TankerTours in Spanish and English to 400 happy visitors. Many had never been on a boat before. Professional education PortSide hosted several waves of college professors enrolled in City Tech's NEH funded program "Along the Shore." The program used Brooklyn’s industrial waterfront as a place-based education teaching tool. We screen water-themed movies, documentaries and feature films, on the tanker. The deck is the auditorium. The screen is on the front of the house. Music with a relationship to the water concerts have included: the Folk Music Society of New York; Sara Bouchard and The Union Street Preservation Society String Band; "Smitty & Co; Jalopy Theatre’s “Roots & Ruckus” featuring: the Two-Man Gentleman Band, Stephanie Nilles, Mamie Minch and Dayna Kurtz, and Feral Foster. Book readings and talks with water themes have included: “Deep Water” a gay love story, and a memoir about sailing. HET VEER - the past, present, and future of New York's waterfront markets; knot-tying demonstration and telling about the history of knots and rope; The romance and commerce of travel by steamboat. PortSide researched, curated and installed MARINER'S RESPONSE TO 9/11, a multimedia exhibit mounted on the steamer LILAC on Pier 25 in Manhattan. We created this for the 10th anniversary of the 9/11 attacks, and it was open September and October 2011. Our exhibit and permanent webpage have more information on this aspect of 9/11 than the National 9/11 Memorial and Museum. "Maritime Messaging" A 2017 collaboration between artist Katherine Behar, PortSide NewYork and Pioneer Works. PortSide contributed all the text from our Red Hook Water Stories which Behar put through a neural network to "teach water to talk." A video presented moving water, and the AI voice speaking the WaterStories language it learned about Red Hook while the words typed over the video. Performers presented the work on all NYC Ferries arriving in Red Hook that day, and the sound was installed on our ship both inside and outside. For the 2007 book "The Graving Dock" by Gabriel Cohen, we created the first cultural event at GMD Shipyard in the Brooklyn Navy Yard, a event called "A BOOK LAUNCH WHERE SHIPS LAUNCH." The site explained aspects of the novel; and access to the site, coupled with our hand-outs, explained the maritime activity. Attendees ogled and photographed the huge graving dock where welding was underway. Inside the the Tailshaft and Valve Shop, guests chatted over hot cider, beer, wine and sandwiches while a slide show of images, overlaid with quotes from the novel, was projected inside the shed wall. A video of the churning waters of the Buttermilk Channel lit up the wall behind Gabriel Cohen while he read. PortSide has organized walking tours with historical WaterStories themes including: Industrial history of Red Hook, Norwegian-American history of Red Hook, and Brooklyn in Development. Spring 2018, we will create a Red Hook WaterStories walking tour. We seek another blockbuster performing arts event to do on our ship, ideally moving to several locations in NYC. Our 2007 TankerOpera was the first public performance in a Port Authority terminal. PortSide co-produced Puccini's "Il Tabarro" staged on the MARY A. WHALEN. The opera was performed and co-produced by Vertical Player Repertory and directed by Beth Greenberg of the New York City Opera. With a background of gantry cranes and passing ships for, the net effect was both innovative opera and a great port appreciation event. The experience netted rave reviews from local, national, and international press and sell out crowds. PortSide set up the on-line ticketing (and grew the opera company's audience from 50 a night to over 400), contracted catering for a reception and cash bar, and set up a mini maritime museum for this WaterStories event. Starting in late 2012, in response to the destructive WaterStories of hurricane Sandy, PortSide stepped up to offer recovery and resiliency work for our neighborhood of Red Hook, Brooklyn. We were honored for our recovery work by the Obama White House and the NYS Senate. Our recovery work served hundreds, our resiliency work helps thousands. In early 2018, after five years, we are concluding that work and are now focused on own Sandy recovery project that was finally approved by FEMA in late 2017. We need to raise $26,000 (10% of the cost) to complete the project by summer 2018, so please donate! September 2016, a partner vessel, the retired tanker LOUIS C, joined us alongside the tanker MARY A. WHALEN. We now have a tiny tanker family! The LOUIS C works in marine construction and is partnering with PortSide to create maritime training programs for youth and adults. The owner of LOUIS C is a partner in Diamond Marine Services, the only company in the USA that trains tug boat operators by giving Towing Endorsement training (TOAR). January 2018, they began doing TOAR training out of Atlantic Basin next to us. PortSide has brought more visiting vessels to Brooklyn than major parks. The vessels have come from overseas, out of state, up state and Manhattan. The list includes a wide range of vessels: tall ships, tugboats, a buoy tender, rowing gigs, kayaks, and a large historic fleet from the Netherlands. We run a visiting vessel ourselves! PortSide invented Kayak Valet in New York City in 2006. Kayak valet is now a common term and practice in NYC. We designed the event to raise awareness that people want to visit by water and to promote that concept. We watched kayaks in Valentino Park so people could paddle in, leave their boats and visit Red Hook. We secured discounts from local stores and handed out our visitor guides to Red Hook. The Red Hook Boaters now run Kayak Valet every time they offer public kayaking, as do many paddling groups around the city. The historic tug CORNELL made several appearances alongside the MARY A. WHALEN. The CORNELL towed the 173’ Steamer LILAC over from Manhattan for City of Water Day during which the Lilac offered ship tours and and two shipboard photo exhibitions. In August, GAZELA, Philadelphia's flagship and the oldest wooden square-rigger still sailing in the USA, was brought to Atlantic Basin by PortSide. She came with daytime tours and two cabaret performances a night on the main deck. PortSide working with the NYC EDC, secured a winter berth for two impressive schooners: the CLIPPER CITY, a 158-foot topsail schooner, and SHEARWATER, a 82-foot 1920's luxury schooner yacht. As part of the deal, PortSide distributed 550 free tickets to community sails on the CLIPPER CITY in late April and early May. PortSide helped bring a fleet of historic vessels from the Netherlands to Brooklyn to commemorate the year-long Hudson Quadricentennial festivities. Some 400 visitors greeted the historic Dutch Flat Bottomed Fleet in Atlantic Basin on Harbor Day, 2009. Visitors swarmed the pier, the Flat Bottom boats, and boarded a surprise visitor in the form of the 150’ barquentine Peacemaker. Co-hosted by NYCEDC. On a raw December day, we attracted 500 people to the pier for the MARY A. WHALEN's 70th birthday party. Visitors also came by water; the historic tug PEGASUS came from Jersey City after picking up guests in Manhattan. The active-duty tug JANICE ANN REINAUER joined the gang. The MV MANHATTAN swung through Atlantic Basin for a cheer and a wave, and several gigs from the Village Community Boathouse and kayaks rowed over from Manhattan. WE can be a VISITING VESSEL! We have been a visiting vessel ourselves, taking the MARY A. WHALEN to Sunset Park for the first, free, bilingual historic ship tours open to the public (at a salsa concert) in 2010. 400 people streamed aboard, it was the first time on a ship for many. PortSide has promoted visiting vessels arranged by other groups such as when we promoted the OpSail/Fleet Week ships in Red Hook in 2012 and Fleet Week 2016 at the Brooklyn Cruise Terminal. Our guide to the 2012 OpSail/Fleet Week ships in Red Hook was so good, OpSail handed out ours. Our webpage for those ships attracted over 26,000 hits in May. Our Twitter and Facebook pages have provided a steady stream of updates about exhibit vessels coming to NYC. At the end of 2017, we were offered an opportunity to to expand into an adjacent warehouse. The opportunity to finally have space to deliver long-intended programs causes us to refocus our programs. We will no longer have harbor advocacy as a stated program. Our focus in early 2018, is on getting the building space where we can finally do more physical programs. The success of those programs will fulfill the vision and replace the talk of our prior advocacy work. We will walk the walk even more and talk the talk less. We will answer questions on a case by case basis. Also check our Waterways Info page for info. Below is our prior Advocacy work. Waterfront Policy recommendations submitted to the de Blasio transition team after his 1st election "Unlocking the potential of NYC’s waterfront, A progressive road map for the Sixth Borough." These were publicly released in May, 2016. Portify as we fortify. Don't let Sandy drown a good idea. Our president Carolina Salguero argued in a 2016 presentation at AIANY that we cannot let post-Sandy resiliency plans drown the good ideas of Vision 2020. To activate our waterways, we need apertures, not solid seawalls. Vision 2020 has an action component for the NYC EDC known as WAVES. 3/16/12 "Transforming NYC's Waterfront - one year update on Waterfront Action Agenda (WAVES). PortSide led an effort to have this hearing have a major focus on the needs of historic vessels in NYC. Here is PortSide testimony, and see our blogpost for more testimony about this hearing which generated impassioned advocacy for historic ships. 6/15/05 Regulatory Obstacles to Waterfront Development (the DEC) City Council Waterfronts Committee, includes a discussion of DEC policy's effect on Red Hook, Brooklyn.